Pharma Franchise for Respiratory Product Range – Pharma Franchise business is considered as a best investment business. Because the increase in problems related to digestion, respiration , psychiatry and others health ailments are continuously rising. Due to bad air quality the respiratory problems are alarming. The cases of patients with respiratory issues are highest than any other diseases. Through Pharma Franchise For Respiratory Product Range Innovexia Life Science is trying to help the patients and others pharma aspirants. Air quality is very bad we all know. This can be very well seen in major cities. We cannot completely reverse the quality of air from bad to good. But yes we can take care of ourselves. And this WHO-GMP certified company ‘’Innovexia Life Science’’ giving everything you need through Pharma Franchise for Respiratory Product Range. Innovexia Life Science understands there is nothing more important than a good and healthy life. With increase incident of respiratory patients, there is a good need of respiratory product range. We supply our medicinal product range, to the hospitals, clinics, pharma shops and active pharma aspirants. High demand of respiratory product range in market. Due to increase in cases of respiratory problems. Have a wide scope in future. WHO has surveyed and conveyed that in coming future the cases of asthma and similar diseases will rise. And to fulfill the need of respiratory product range only franchise partners can be helpful. Hospitals and clinics are always in need for respiratory product range. This pharma franchise business, will give a boost to your business. We can ourselves very well access the situation of today’s pharmaceutical market. India has highest number of population and here more than 50% population is suffering from respiratory problems. And now you know people are in high need of these products. Our company is certified and licensed by every required department. We aim to work with all legal and authorized way. Our products and our manufacturing firm everything is of high standard and follow full advancement in their practices. Product used for manufacturing of medicines and all product list is certified by GMP and FSSAI. As atop pharma company Innovexia Life Sciences takes full care their position and keeps maintaining the excellency in our services. We manufacture the products in our own WHO certified firms. Where we take full care of the drugs quality used in manufacturing medicines. Our talented and highly qualified medical experts carefully supervise every step. From manufacturing to packaging our experts are always vigilant. Mistakes and carelessness is never entertained in our manufacturing firms. Innovexia Life Science is the leading pharmaceutical company. Not only for respiratory product range, but for all possible product range. Working in the same domain since 12 years. You can completely trust the company with products, services and certification . Provide promotional tools and marketing strategies to their sales associates, distributors and franchise partners. Offers monopoly rights, which helps beginners to cut the competition in their market area or locality. Keep their associates updated with pharmaceutical industry through letter head. Never allow any situation which let down their franchise partners. Pharma franchise business not evolved today. It has a very bright past and surely do have a great future too. This business investment will be worthy of your hard earned money. 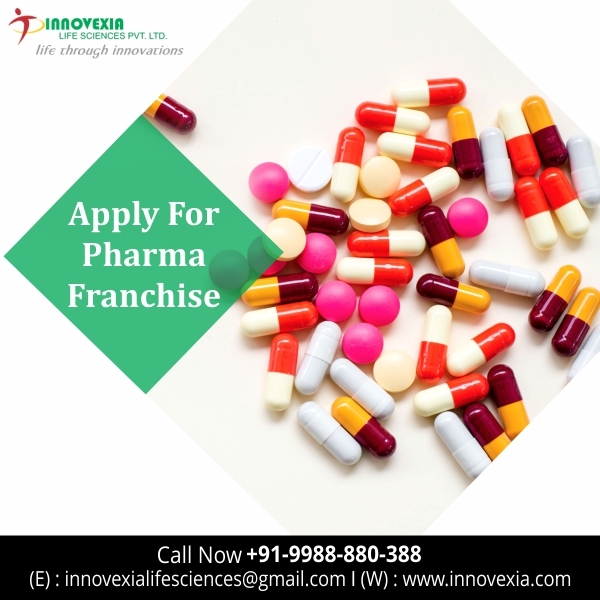 If you truly want to have a career in pharma sector this is the great opportunity offered to by Innovexia Life Science.